Today Saint Michael gave me a tasty surprise, lunch! Saint Michael took the time to make me a sandwich, just the way I like it. 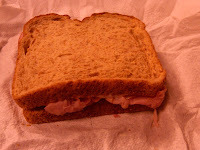 Two slices of plain old wheat bread, a little light mayo and ham. Perfection. Wrap that bad boy up in a paper towel ( so it doesn't get soggy or smooshed) and stick it in a Target brand zipper bag ( no Ziploc for our frugal household! Our sammiches can suffer.) and there you have, my lunch. My lunch that filled my belly and gave my heart tinglies. Thanks Saint Michael! Me and the belly* thank you! * Yes my belly speaks, it must in order to exude the kind of control over me it has. It always wants to eat, what is up with that?! Shovel it in as fast as you can, cause honey, this dip goes FAST. Cook, shred/ chop/ mince the chicken to your desired consistency/ size. While the chicken is cooking pop your two blocks of unwrapped cream cheese into the bottom of the crock pot, set the tempature to low. Add in the Monty Jack cheese, hot sauce and ranch. When the chicken is ready toss it in on TOP of the other ingredients. It is important to put the chicken on top so that the other ingredients that need to actually melt/ cook get the most heat. This will make your dip creamier and your chicken less burned. Cover the whole gooey mess and let simmer for 30 minutes. Stir it up, repeat as necessary until the dip comes together in a creamy consistency and all the ingredients are mixed in and warmed. If you are in a hurry and want your dip quickly, crank it up to high heat and it only takes about 30 minutes to be ready. It tastes better if you wait and let it all come together slowly. It smells like tangy buffalo chicken wings and tastes amazing on little pieces of bread, Fritos or tortilla chips. What ever you prefer. I have never met a single person who did not LOVE this dip. For extra fun, serve with sides of celery that have been smeared with chunky blue cheese dressing for dipping. Yum, Yum, Yum! A special note to pregnant/ nursing friends, add the hot sauce in a little at a time to get the “tang” of the flavor but none of the heart burn causing heat. I made the mistake of eating this dip while nursing my daughter and I have not lived down the horror of how bad spice can make a baby hurt. You can always set some plain dip aside for you and just sprinkle hot sauce to taste in it if you are worried and let every one else eat the fully cranked sauce. So good, you will not want to miss out.